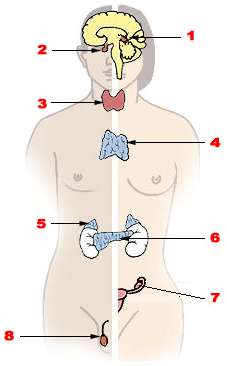 Endocrinology is a branch of medicine dealing with the endocrine system, its diseases, and its secretions called hormones. Although every organ system secretes and responds to hormones (including the brain, lungs, heart, intestine, skin, and the kidney), endocrinology focuses on the endocrine organs: the adrenals, ovaries,pancreas pituitary, thyroid and testes. An endocrinologist is a doctor who specialises in treating endocrine disorders, such as hyperthyroidism and thyroid cancer and hypothyroidism.